Core Java - OOP Concepts, Garbage Collection, Multi-threading, Collections Framework, Java 8 Features, Lambda Functions, Streams. Core Java - OOPS, Inheritance, Garbage Collection, multi-threading & Concurrency, Java Collections framework. How does Mark and Sweep Work? What are different Memory generations in java? How will you troubleshoot Memory Issues in a Java application running in production? What is Non Blocking Algorithm? What is CAS? What is use of CopyOnWriteArrayList? What is ThreadLocalRandom? when should one use it over Random? What is Dead Lock in Java, how will you detect a dead lock in a given application? What steps you will take to avoid the deadlock situation? What are Immutable Objects? What is benefit of it? What is Thread Pool? How will you implement a basic thread pool from scratch? How are Concurrent Collections different from Normal Collections? What is a Blocking Queue? What is difference between ArrayBlockingQueue, DelayQueue and LinkedBlockingQueue in Java? What is ThreadLocal Object? Give a example of its use? What is CompletionService or ExecutorCompletion Service? Give a practical use case. What is special about classes present in concurrent.atomic package? What is CAS? What is Stamped Lock introduced in Java 8? There are 3 different threads in a single method, how will you make then run sequentially? What is difference between Hashmap and ConcurrentHashMap? What is Merge Sort? Which Sorting is used by Java Collections.sort() internally? Write a Program that calculates Prime Numbers in Java. Design and Implement a File Storage for millions of files. Consider that not more than 1000 files should be placed inside a single directory. 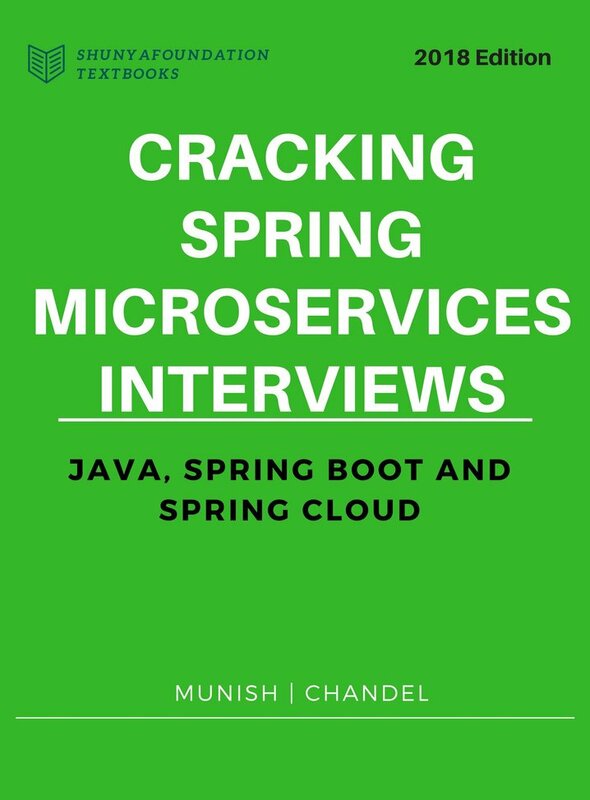 This ebook discusses 120 plus real problems and their solutions for Spring microservices architecture based on Spring Boot, Spring Cloud, Cloud Native Applications. It covers core concepts of microservices architecture, various design patterns, interview questions & answers, security in microservices, testing strategies and best practices in distributed system design.